Choose a flashlight that is good for youÂ?and your plants. 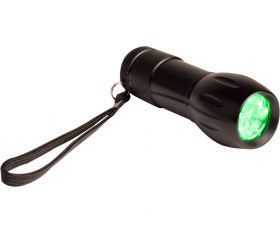 The Active Eye flashlight shines a beam of green light through its 9 powerful, high-intensity LED bulbs. The benefit of green light over white is that green doesn't interrupt the essential plant photosynthesis process, whereas bursts of white light can be incredibly disruptive. The green bulbs, which burn for over 100,000 hours, are bright enough to be used for a number of other night light needs. Uses three AAA batteries (sold separately).